Regardless of what the Weather Channel tells me, regardless of anyone else’s forecast, even more authoritative–if you can imagine this–than the groundhog, by that single breath I knew. I lived in Nicaragua for seven years. We had different seasons and played a different waiting game. We watched dry season get hotter and drier and dustier and then, when you thought it was unbearable, get more humid, and more humid again, but still without a drop of rain. It started in February. By May, we prayed hard for rain. I had forgotten waiting through winter for spring. Not the idea of it, but the feeling. We had a *&(#-ton of snow in February and severely cold temps. Kim and I drove into a blizzard because we were on a schedule that allowed no Plan B and we still almost stopped because, well, dying was not a good Plan A. Short, cold days and bitterly cold nights. Watching the sun drop behind the mountains at 3:15 PM. You know it has to end but no one can tell you when. I’m not a skier. My niece broke her foot sledding this winter, which kind of put a damper on that activity for us. The Sunday before last, my 11-year-old son asked me to go play one-on-one basketball with him. He’d had enough of being cooped up. So we did. We started in 34 degrees and ended in 29. The ball that promised it would not go flat kept its word admirably. We ran hard enough not to freeze. It was cold. Now we have flowers coming up through the snow around our house. We are watching the snow mountain that the plows piled up in our cul-de-sac lose its war of attrition. Winter has been gorgeous. From an aesthetic standpoint, watching the mountains go white, covered in new snow over and over, has been stunning. One day when we took the dogs on a hike, we reached an altitude where the snow had crystallized. It shined like a hillside of diamonds in the sun and, when you scooped a handful in your glove, it shattered, not powder, not flakes, but truly crystals. You could hear the snow breaking as it fell from your hand. On a walk home one night, the flakes were so big that when I caught them in my mouth–completely owning how ridiculous I looked, out on the sidewalk, mouth gaping, picking out flakes to track and capture–a single flake filled my mouth. I know that sounds like I’m exaggerating. When I missed, they soaked my nose or a side of my face. I have no video proof, but they were the biggest flakes I’ve ever seen in my life and I’ve lived in both Illinois and Colorado. I can both appreciate winter’s beauty and long for spring. I find nothing contradictory, nothing mutually exclusive in these responses. In fact, I feel the same about Lent and Easter. Lent means taking time to see my own brokenness. To focus on repentance. To face the distance I have let my heart move away from God and even let myself consider the causes. It’s more pleasant to focus exclusively on God’s beauty and love for me than on my sin and self-rejection. But looking only at the happy stuff doesn’t make the ugly stuff go away, it merely gives it more space to grow. My analogy here is not that winter is a time of darkness, though I personally could certainly use more sunlight than Wenatchee winter provides. I’m saying that, if I allow myself, I can see this time of self-reflection and facing truth has beauty, too. It’s easier to see the beauty of Easter. 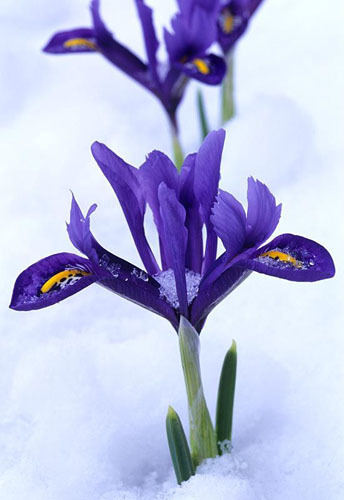 Flowers offer more obvious beauty than snow. It’s easier (and tempting) to jump straight to the good news without spending time meditating on and offering up the bad. But I don’t simply mean Easter is more beautiful because I’ve gone deeper into Lent. It’s true that “Hallelujah” has a truer ring to it when I have repented as fully as I can. I mean I can see some moments of beauty in the ashes themselves. I’ve been in a dark place spiritually for a while now. I know that and it’s not something I can fix quickly or even at all, on my own. Knowing it doesn’t solve it. But finding hope in darkness holds a different beauty than happy celebration. Trusting God in the darkness means knowing God here, now, in this darkness. That is a moment of winter beauty, not spring. I’m glad spring is coming. I’m trusting that the darkness I’m in will not last forever, either. I’m trusting I will learn and grow from it, as I always have from these deep tunnels in my life. Trusting is not the same as knowing. There’s a lot more hope involved. There’s also a lot more doubt. God is walking through this season with me. I don’t think winter will become my favorite season; I don’t think this will become my favorite season in life. But these glimpses of beauty are undeniable. I appreciate them, even as I long for more light. Beautifully written and full of truth. And the fact is that you are walking through it and ‘hope does not disappoint us, because God has poured out his love into our hearts through the Holy Spirit, whom he has given us. (Rom 5.5) Your life journey is proof of that! Thanks, Beverlee. Thanks for praying for us so faithfully. Beautifully written and full of truth. Can’t help but think of Rom 5.1-5 when I think of you and your journey. I love your heart and your determination. The promise of Song of Songs 2:10-13 is on the horizon.